To say concrete is a versatile building material is an understatement. It lends itself to so many applications and can be used to create almost every major element of your home, from ground and upper floor slabs, to walls, roofing, pavements, driveways and retaining walls. You can even use it to create unique design features like polished concrete floors, internal feature walls, and kitchen and bathroom bench-tops. 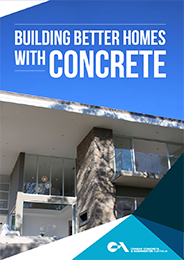 The strength, durability, thermal efficiency, speed of construction, design versatility and raw beauty of concrete makes it an ideal solution for designers, builders and homeowners. Concrete is the ideal construction medium for upper flooring. Its density and strength ensures your floor won't creak or vibrate and helps minimise transmission of noise between floors. Concrete walls have inherent strength and durability and requires minimal maintenance over the lifetime of your home. Faced with the challenges of a sloping block, a filled-in swimming pool and potential bushfire hazards, the owners of this five-bedroom home in Sydney's northern suburbs chose concrete not just for its structural qualities, but its ability to deliver an elegant, efficient and time-saving design solution.